Today we’re happy to announce that after several months of setting up shop (and slight procrastination and fear on my part), it’s finally here. So, without further ado, we bring you the Online Reputation Management Guide from Outspoken Media. We think you’ll find it was worth the wait. Why did we write the ORM guide? When we found ourselves quoted in the Wall Street Journal trying to help Julia Angwin fix her reputation on Google, we received a lot of interest in our reputation management services. The exposure brought us some great clients, but it also introduced us to folks who had more questions than they did a budget (or desire) to hire an outside SEO company. When we talked to many of these small business owners we found that they shared the same, basic problems. Issues that could be very easily fixed by following a few best practices. We wanted to create a resource that would help them, something they could turn to. That’s where this Guide comes from. The ORM Guide was written with individuals and small businesses in mind. If you’re reading this because you have a more serious reputation management problem, this isn’t the Guide for you. Instead, contact us and we’d love to speak with you about how we can help. Why do you need an online reputation? How can a negative online reputation affect you? How do you assess your online reputation? When do you need professional online reputation management? How do you protect your name online? How do you customize privacy settings on your social profiles? What are the best tools to monitor your online reputation? How do build your online reputation? How can you prevent reputation problems? How should you respond to negative criticism? Where can you turn for more information and news on the ORM industry? 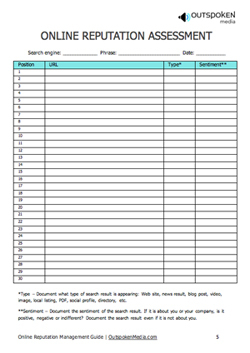 We’ve also included a sample ORM assessment sheet (pictured here), which can be used as a template for your own spreadsheet or printed and filled out on the spot. It’s important that you document how the search results change over time once you start actively working on your reputation. This assessment will also help pinpoint whether you need professional services or just need to get started on the basics. After you’ve read the guide, if you have any questions, suggestions, comments or concerns, please post them below or contact us and we’ll get back to you as soon as possible. And that’s that. We introduce you to the absolutely free Online Reputation Management Guide from Outspoken Media. Please download it or Rae and Lisa will beat me like the red-headed stepchild I am. Thanks.